What would you do as head of ///M division? Fast and fairly fab, if not faithful to the original. And there is the problem; the vast majority of people who see an M badged BMW simply know it as the most expensive version. A fair portion of people who buy M badged cars do so because of their price and their heritage. But these folks don’t want a race car for the road and could care less about curb weight, skidpad g’s and perfect 50:50 weight distribution, they want a nice comfortable car that is expensive and powerful, special bonus if you can make it look different from the standard model too. M cars were never supposed to be the most comfortable, or luxurious models nor were they supposed to have the biggest, most powerful engines. They were supposed to be the white-knuckled, in-your-face models showcased by an aggressive racing inspired engine and sublimely balanced chassis. They were supposed to be faster around a race track than similar cars with much larger engines. If you were to take the 4.4L twin-turbo V8 from the 5,6&7 series and shoehorn it into the 4 series, not only would you create a car that could be sold for the same price as an M4 but it would be more powerful. 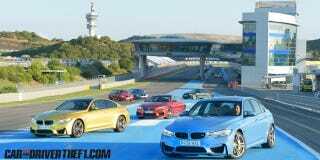 We know BMW V8’s fit in 3 and 4 series cars, BMW would just load it up full of standard options and suddenly there is a car to distract the non-petrolsexuals from the M division. The M lovers get to keep their cars in racetrack ready shape, knowing that their car is lighter and more nimble than their 450i grand tourer brethren. Would the 760i’s V12 fit in a 6 series? It’s been done a hundred times by enthusiasts, and once again we have a more powerful touring car version of the 6 series to allow the M6 to keep its Hi-Po, smaller engine and allow it to be quicker in the corners. This also allows the 4 and 6 series to begin truly evolving on their own by offering engines that their 3 and 5 counter parts do not. What does BMW get out of this? It gets a way to sell two brand new models that are merely parts-bin factory mods at a high exclusive price which keeps our beloved M-cars funded without tarnishing their reputation and knife-edge abilities. BMW can even use M inspired body panels to help further differentiate these apex models from the standard series to help justify price. Thoughts? My only hold-up is badging. There would have to be a logo of some sort to let everyone know that this is the most powerful and expensive version of the series. Sadly, they have burned the GT badge on Frankenstein-cars. They could call them ///MGT models or perhaps even bring back the old “s” at the end of the number.